In January-May of this year, the actual cost of gross agricultural products amounted to 1.77 billion manats ($1.04 billion), of which 1.46 billion manats ($858,800 million) accounts for the share of livestock, and 307.7 million manats ($181 million) for crop production. 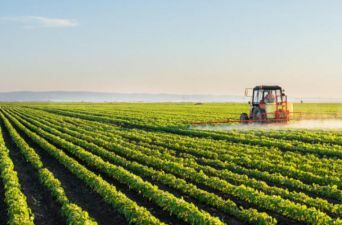 According to the State Statistics Committee, as compared to previous year, the growth in agricultural production amounted to 8.5 percent, including 52 percent in crop production and 2.5 percent in livestock production. Until the end of May, 71.7 tons of grain crops were harvested from the fields, which is 4.1 times more than in the same period last year, 135,400 tons of potatoes were harvested (up 66.6 percent compared to the previous period), 217,000 tons of vegetables (up 56.2 percent over the previous period), 13,100 tons of fruits and berries, up 17.3 percent from the previous indicator, 353,200 tons of green tea leaves. Azerbaijan has 4.8 million hectares of agricultural land, which comprises over 50 percent of its total territory, of which 39.6 percent is arable. Meanwhile, the food-processing sector constitutes an important component of the national economy and accounts for over 38 percent of total manufacturing industry. Agricultural producers are exempted from paying all taxes (except tax for land) in Azerbaijan, in accordance with the Law “On granting tax benefits to producers of agricultural products,” adopted on November, 2001. The revival of agriculture sector plays an important role in the development of rural regions, where 47 percent of Azerbaijan’s population lives.